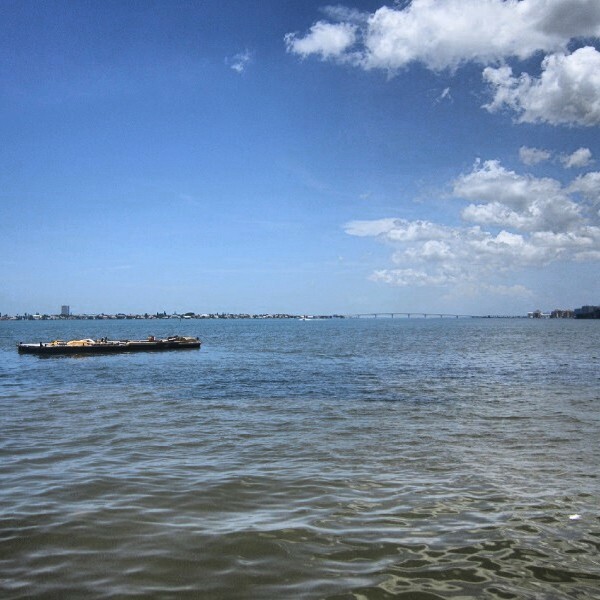 Photo of the Week: Staring Out Into Sarasota Bay. Photo of the Week: The Open Water in Sarasota. I captured this shot as a passenger going over the Siesta Key Bridge (Siesta Dr., SR 758) in Sarasota, Florida. It connects Siesta Key with the mainland. Looking north, just the open waters straight ahead. Off in the distance you can see condo high rises and the John Ringling Bridge which connects the mainland with Lido and Longboat Keys and lots more Gulf of Mexico beachfront. Photo of the Week: Relaxing along Sarasota Bay. Checkout Florida: Sarasota Bayfront Park Part II for more details on all the fun at Oleary’s. Florida: Sarasota Bayfront Park Part II. It was a lot of fun checking out Bayfront Park in Sarasota. Lot’s of greenery, kid’s having fun and palm trees, boats and high-rise condos dotting the landscape around Sarasota Bay. It was time to quench our thirst and relax after walking around the parks peninsula. My girlfriend and I noticed a bunch of tiki huts in the one part of the park we’d yet to scope out. We walked over and saw the entrance to Oleary’s Tiki Bar and Grill. Palm trees and tiki huts galore. We sat down on some stools at the outside bar, luckily right next to a cooling fan. The sunglasses came off and it was Rum Floaters time. It’s one of their signature drinks yum. They had a good selection of appetizers but we decided to just drink and enjoy the tropical atmosphere. Doing a 180 on our bar stools this was the view in front of us. Palm trees, boats and Sarasota Bay, what could be better?! Oleary’s offers plenty of picnic style seating along the bar and the water as well. Like many places around here, people were coming to the bar not just on foot or by car, they docked their boats along the nearby shore as well. …you’ll find water sport renting opportunities at Enticer Water Sports. Sailboats, jet skis, paddle boats and kayaks you’ll find. Will have to get out on the open water next time. More high-rise condos to look at off in the distance. Oleary’s Tiki Bar and Grill was a great way to relax and cool down. Great cocktails and paradise indeed as their sign indicates. I would recommend stopping in if hanging around Sarasota Bay and Bayfront Park (Island Park). What is your favorite tiki, tropical, outdoor, beach bar in Florida? Anywhere?